TORONTO, Canada — Deluxe Toronto Ltd., one of the world’s most prestigious and successful suppliers of services and technologies to the worldwide entertainment industry, has completed relocation to a new state-of-the-art facility on King Street West in Toronto. Affirming its commitment to offering the very best in technology, Deluxe has standardized on HARMAN’s JBL M2 Master Reference Monitors, Crown Macro-Tech 9000i amplifiers, and BSS Soundweb London processing. Deluxe Toronto’s main theaters are equipped with three JBL M2 Master Reference Monitors behind the screen in a left-center-right configuration, powered by Crown Macro-Tech 9000i amplifiers and tuned using BSS Soundweb London processing. 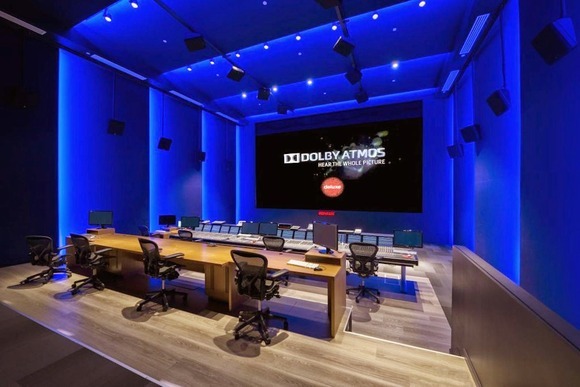 Deluxe’s largest mixing stage, Mix 1, is also Canada’s first Dolby Atmos-equipped mixing stage (while also being equipped for IMAX). Deluxe chose JBL 3 Series Studio Monitors in its pre-mix room. The monitoring systems were supplied by HARMAN’s distributor, SC Media Canada. The choice of HARMAN equipment was the result of Deluxe’s extensive evaluation of the world’s best technologies, and the M2 monitors stood out markedly from the competition. “We did a lot of testing with a lot of different systems, and the M2’s sounded terrific right out of the box,” said Mike Baskerville, Manager, Sound Operations, Deluxe Toronto Ltd.
“When we first listened to the M2 speakers, it was so easy to hear the difference compared to other monitors we tested. The flatness and consistency across the room, was very evident, it didn’t matter where we stood in the room. It was amazing!” Iannelli said. “Mixing requires critical listening. The second we changed something in the EQ, there was an instant response from the M2 speakers. This accurate sound reproduction effortlessly allows us to find the balance among so many different elements. We could hear the difference right away. It makes mixing exciting,” Baskerville said. Moreover, the Crown amplification provides Deluxe Toronto with plenty of flexibility, regardless of the project. “We need a lot of headroom and dynamic range for a lot of the theatrical mixing we do, and the Crown amps give us that and more,” Baskerville said. Since 1915, Deluxe has been the trusted partner for the world’s most successful Hollywood studios, independent film companies, TV networks, exhibitors, advertisers and others, offering best-in-class solutions in production, post production, distribution, asset and workflow management, and new digital solution-based technologies. With operations in Los Angeles, New York and around the globe, the company employs nearly 6,000 of the most talented, highly honored and recognized artists and industry veterans worldwide. Deluxe is a wholly owned subsidiary of MacAndrews & Forbes Holdings Inc. For more information visit www.bydeluxe.com and www.bydeluxetoronto.com.